Panel Discussion featuring Steve Martin, Rick McCallum, David Chasman, Bernie Cutler, Jessica Harper, Bob Mackie and Richard Marks. 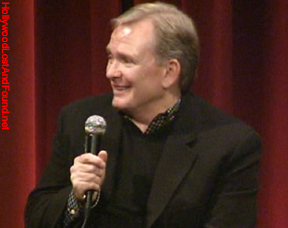 I was really excited when I received the notice of the "Pennies From Heaven" screening. Hmmm. "Pennies From Heaven." I was 11 when that came out. I invited along a friend who had never been to an Academy event before, telling her we were going to go see "the black and white movie with all of the little people in it." Armed with this misinformation, away we went. We arrived about an hour early, thinking we would be one of the first people there, but the theater was already about half full. That's when it's fun to sit there and chat and watch people as they come in. Everyone gets pissed off when they come in and see that all of the good seats are roped off. There are people milling around, asking the ushers why the middle section is reserved. Hank Azaria ambles in, talking on his cell phone, and plops down off to the side along with the common folk. A voice comes from behind me: "Would you like to try one of my decorative foil balls?" I half-turn to see a man's hand holding some Sees ornament chocolate balls. Remembering the old adage "never take candy from strangers," I politely refuse. "Are you sure, Miss?" came the voice again, "My decorative foil balls are sure to satisfy." I have no response to that. Steve Martin walks in and unceremoniously finds a seat. About 10 minutes into the movie I realized that no, we're not here to watch "Dead Men Don't Wear Plaid." I've never seen this movie before. I was mesmerized. I didn't take my eyes off of the screen except to watch Steve Martin's silvery white hair standing out in the sea of heads. Leaning forward with his chin on his hand, he watched the screen like he was seeing it all for the first time. The post-movie moderation got off to a rip-roaring start. The moderator was chosen because when "Pennies From Heaven" originally came out, he was the only guy who gave it a good review. Other than that, he seemed a tad out of place. I'm not pointing fingers or anything, it's not like I could do his job...but it's times like this when I start appreciating Leonard Maltin. 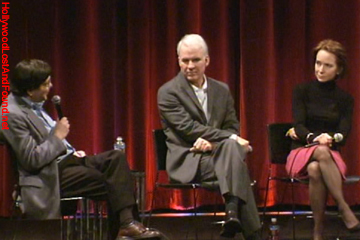 I wasn't sure if Steve Martin was annoyed at the moderator, or just being dry. Moderator: "Why did you make the movie?" Steve Martin: "Emotional reasons boring to go into." A few minutes later we find out that Steve Martin didn't know how to dance before filming "Pennies From Heaven," and Danny Daniels taught him all those steps in about six months. Steve Martin: How would you know? Then the moderator nervously turned to Jessica Harper. Steve Martin piped up: "I still have a mike." Steve Martin got the idea to do "Pennies From Heaven" after watching a much longer production of it from BBC. Jessica Harper said that she was drawn to the bizarre quality of the film, and only saw the BBC version later. She, like almost everyone else, was originally expecting to see "The Jerk II" instead of a dark musical. Oh boy...there's Producer Rick McCallum. You might remember him if you watch the supplementary material that goes on the Star Wars - Episode I: The Phantom Menace DVD. He produced that film too. On the Star Wars DVD he talks about how Phantom Menace was the most amazing project he's ever worked on, and it was a real privilege to get to work with everyone and it was just such an incredible experience. 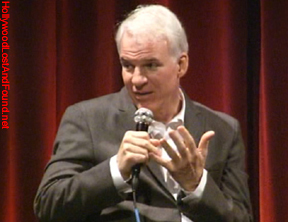 Steve Martin talked for a little bit about how the art fit into the film. Referring to the Depression-era collage during the "Pennies From Heaven" song number, he said it was like acting inside a painting. What a great analogy, because, you know... that's kind of what it looked like. Typically associating him with his elaborate costume design, Bob Mackie said they didn't really want to hire him at first. They didn't think he could sew rags. Not only did he make all of the costumes from scratch, but he also got the job of making some old-style underwear for Steve Martin to wear in some of the scenes. Martin said he wasn't really thinking and wore them all the time they were shooting, whether the scene called for him to have his pants down or not. Jessica stated she didn't get any old fashioned underwear. Steve Martin deadpanned "I've got them. I'm wearing them now." In the bank scene, notice that Martin has a handkerchief in his pocket made of folded money. That Bob Mackie is good. By this time the moderator's "huh?" and "what?" commentary is wearing thin. There was bad flow going on here. Here, at the Academy, the largest screening that "Pennies From Heaven" has ever had. Oh well. The talk skipped around from person to person. I noticed things around the theater. The freckles on the back of my hand. I played with my pen. I'm brought back into the floundering on the stage when someone mentions there was a scene cut where the accordion player kills himself. I wonder if that will make it to the DVD Special Edition? I wonder if a DVD Special Edition will ever be produced? Steve Martin: "As you watch the film, you can almost feel it running out of money." He waived his averages to help the movie financially. That was nice of him. 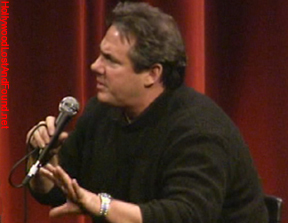 Rick McCallum talks. Apparently, working on "Pennies from Heaven" was the most incredible experience for him. He felt really privileged to be a part of this amazing movie. So now the panel is discussing how "Pennies From Heaven" flopped. BADLY. It wasn't what everyone expected... it wasn't "The Jerk II" and it sure as heck isn't some sunny family musical. It had bad marketing. People didn't know what to do with it, or how to take it. There was a sneak preview in Denver. Fifteen-hundred person theater with a cineorama screen that would ripple from the air conditioning. The oldest person in the audience was around 18 and they were having to make them go back in and watch the rest of the show. People were giving their money back for filling out the questionnaires. "Maybe Lorena Bobbit as a young girl was in that audience," someone quipped. One of the guys brought up "The Wizard of Oz." It lost a million dollars when it first came out, and didn't make much money until the 50s when it was sold to television. Now we think of it as some big family classic. I make a mental note to watch "Pennies From Heaven" on Thanksgiving with my grandkids in the year 2030. I'll let you know if it's like "The Wizard of Oz." No mention was made of Pennies From Heaven's sound crew. I would like to take this opportunity to mention the owner of this website's coworker, sound editor Richard L. Anderson (aka The Funniest Person in the Entire World) and Steve Flick. Okay, there it is. They filmed much of the movie in 44 sets on location. That must have been expensive. The same spot where Steve Martin picked up the accordion player was in "North by Northwest." I feel a movie-location article coming on. Steve Martin: "I remember an anectode that has no point" and then he quickly tells about turning around and seeing Cary Grant standing there. Moderator: "So that connects it to North by Northwest." Steve Martin was asked about his impression of Christopher Walken. Not surprisingly he said "I was afraid of him" and then "Who knew he could dance?" Jessica: Well, Christopher Walken was on Broadway. Steve Martin: Oh. Well, I guess that's how you would know then. This was the first dramatic role and only the second movie for Steve Martin, who at the time thought wearing period underwear made him a good actor. He talked about how "The scenes and sets felt real, you got a real feeling of being there. Like now." Did Steve Martin know going in that this would be an art film for a specialized audience? He hoped that people would like it for the musical numbers, and then he said something that cleared up a lot of Hollywood for me "You need the will to believe that the movie will be great." Steve Martin: Are we wrapping up soon? And it was over. I always expect the endings to be different. They always seem so...abrupt. I went home and looked up Pennies From Heaven on IMDB.com. Under "Recommendations" it said "If you like this title, we also recommend: Sid and Nancy." Okay...I guess I can see that. Sort of. Pennies From Heaven is not a typical Hollywood cookie-cutter movie, which, in my opinion, makes it a must-see for any movie fan. I mean, it's worth it just to get to see Christopher Walken doing a striptease. It was an amazing experience, and a real privilege to get to be in the audience.